The majority of the Adidas Copa 18.3 Firm Ground football boot’s commenters said that the pair provides a comfortable fit. A significant number of players mentioned that the pair is lightweight. Some footballers have commended the excellent ball touch that the firm ground boot provides through its cow leather upper. The Adidas Copa 18.3 FG football boot belongs to a budget-friendly price range. Numerous wearers remarked that they would recommend the football boot to others. A few users praised the quality of these football cleats. A couple of purchasers remarked that the Copa 18.3 FG brings good value for money. One says that she highly appreciates the style of the pair. The majority of reviewers had concerns regarding the football boot’s narrow fit. A prevalent concern raised by the majority of the Adidas Copa 18.3 FG football boots’ users are durability issues. Several users gave detailed reports about their pair starting to tear even after just a couple of sessions. One wearer shared that he found the Adidas Copa 18.3 Copa Firm Ground boot rather high and has caused him to develop blisters. Another user found that as the pair gets wet, the leather upper tends to chip away. Comfort is what the Adidas Copa 18.3 Firm Ground football boot was built for, as confirmed by a majority of its users. Several players have also praised the shoe’s ability to provide an excellent ball touch. It also lauded for its overall quality especially for being lightweight. All these for a budget-friendly price. However, some users raised durability and sizing issues. Even so, the good things convincingly outweigh the bad. 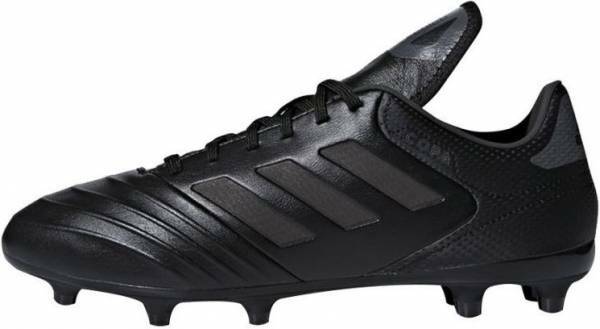 Hence, the Adidas Copa 18.3 Firm Ground boot should still be number one on your list. If there’s one thing that the Adidas Copa line is known for, it’s its ability to give comfort to players on the pitch. The Adidas Copa 18.3 Firm Ground football boot is no different. Sporting a cow leather vamp, the material brings softness and comfort to its players. An embossed texture can also be found in the upper to further promote ball control. Keeping the classic look that the Adidas Copa collection is known for, this model sports a fold-over tongue which carries an air of a traditional football boot. To complete the iconic appeal, a central lacing system is also integrated into the upper to help further the football boot’s fit. The heel counter is a foam-based material which adds to the shoe’s level of comfort. The outsole of this firm ground version is created with a Thermoplastic polyurethane (TPU) material which is an unsurprising element in football cleats. This material is well-known for being lightweight, flexible, and for its shock absorbing qualities. The stud configuration consists of a total of eleven conical studs. The Adidas Copa 18.3 Firm Ground football boot provides a natural comfort wrap through its cow leather upper that adjusts to the contours of the foot with time. It is available in men’s standard sizes ranging from 8 to 13. A central lacing system is incorporated into the fold-over tongue to further the shoe’s fit. The Adidas Nemeziz 18.1 FG and the Adidas Predator 19.1 FG have a similar fit customization mechanism even if these models have a tongueless design. It is noteworthy that the consensus from a significant number of reviewers concluded that the pair’s sizing is a bit small. Several have recommended going for a half to a full size up to get the best possible fit. The upper construction of the Adidas Copa 18.3 FG football boot consists of cow leather which is known for its softness. The material brings a foot-hugging sensation bring while the embossing feature promotes ball control. A fold-over tongue maintains the air of classic design reminiscent of the Copa collection. Furthermore, the central lacing system serves to provide a more personalized fit. The heel counter is created with a foam-based material which adds up to the cleat’s comfort. TPU has been used in the construction of the outsole. The stud configuration which features conical studs is ideal for firm ground courts. The stud shape promotes classic rotational traction. A total of eleven studs have been arranged to produce smooth ground penetration. An indoor version of the Adidas Copa 18.3 Firm Ground football boot is also available.